Network Rail has awarded contracts worth around £164M for station and overhead power line upgrades on routes to the west of London, some of which are needed in preparation for the arrival of Crossrail. 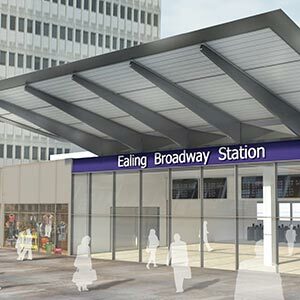 A £100M contract has gone to VINCI Construction UK Ltd for design and renovation of 13 stations in west London and Berkshire. This is for improvements to stations from Acton Main Line to Maidenhead with many being refurbished or partly rebuilt in preparation for Crossrail services. Improvements will include new station buildings and ticket halls, new lifts to deliver step-free access and longer platforms. Detailed design work will begin at the end of 2013 and main works will take place between mid-2014 and 2018. Balfour Beatty has been awarded a £64M contract that involves the installation of electric overhead line equipment between Airport Junction and Maidenhead, electrifying all of the running lines to allow flexible pathing of Crossrail services as well as accommodating new express trains on the Great Western route. The remainder of the Great Western route to Swansea is being electrified as part of a wider programme that will allow electric trains to operate from late 2016. Crossrail will start services through central London in late 2018 with the full route running in 2019. New electric Crossrail trains will allow passengers in west London and Berkshire to travel through central London and to Shenfield in Essex and Abbey Wood in south east London, reducing journey times and making it quicker and easier for people to get to a range of destinations across London and the South East.